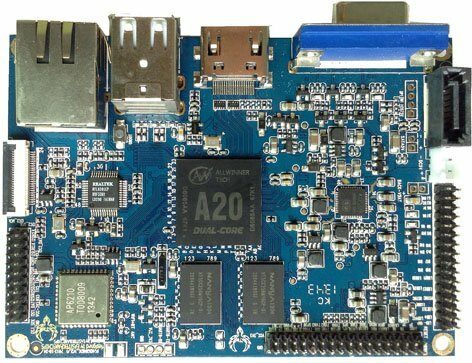 Anichips Technology, a Shenzhen based electronics design company, has just announced PhoenixA20, a pico-ITX board features AllWinner A20 dual core Cortex A20 SoC with 1GB, 4GB Flash, HDMI and VGA output, Ethernet, and built-in Wi-fi and Bluetooth. The board supports Android 4.2.2, and Linux 3.3 with source code for Linux, Android, and U-boot available from the company’s github account. Documentation and schematics (PDF format) are also available. There are two directory for English and Chinese documentation, but at the moment don’t bother with the English version (basically empty), and all interesting docs are in the Chinese directory. There’s also a Wiki (short but in English, and with somewhat useful links), and a forum, in Chinese only for now, which could be the place where to find bootable Ubuntu or Android images for the board. It’s one of the rare boards to come with built-in Wi-Fi and Bluetooth in this price category ($69 including shipping), as well as a CSI connector (although it’s unclear if any cam is supported right now). The VGA output may be an advantage too. In theory, you should be able to purchase pico-ITX case for the board, but as noted on linux-sunix mailing list, there are not that many off-the-shelf Pico-ITX cases, so this may not be that much of an advantage. The board can be purchased on Aliexpress for $69 including shipping via China Post, or on Taobao for 369 CNY (~ $60.50). but how this board works? can I install on a lunux arm distribution without pain? what distribution? Not sure, this particular board is very for to use with XBMC. There’s some work to reverse-enginner the VP in A10 (is the the same in A20). But after AllWinner A10 experience, XBMC developers may not be willing to put efforts in this platform. That’s the problem for people who don’t read Chinese with this board, including myself. At this time, I could not find images on the Wiki, and although the forum is in Chinese, I could see some download links for Ubuntu images there. Support may be a problem, if they are not willing, or don’t have the resources, to provide better documentation and support in English. Near identical specs to cubieboard2. Competition. Don’t try to cheat us with that “1.2Ghz”: faster than 912Mhz, A20 start to melt down! I think the price is $59 instead of $69? anyway this seems a better deal comparing to cubieboard2. cuibeboard2 is slightly more expensive(5%), and it does not have CSI-camera, VGA and wifi/BT _onboard_. The price announced in their blog post is $59, but when you want to buy on Aliexpress it is $69 with free shipping. So maybe it’s $59 for the board, and $69 including shipping. The prices announced for other low cost boards such as R-Pi, Beaglebone Black, Cubieboard (2) usually do not include shipping so for comparison purpose, $59 should be a better number. Really ? any sources ? Allwinner A10, A13, and A20 are not any good for XBMC yet, and still does not look promising since it has gone a year now without A10 support even though it is a very cheap and popular platform. Allwinner A10, A13, and A20 SoC’s all uses the same type of CedarX (CedarV VPU and CedarA APU via libve) for hardware accelerated video and audio decoding. But if you are a developer and you managed to get the CedarX Video Processor Unit working on A10 then it should also work on A20, and vice verse. Otherwise you just have to continue to wait until Allwinner realize that they need to open source their CedarX library and drivers under LGPL or GPL if they like their products support XBMC. Not gonna happen. Allwinner has been around for a while now and if they were going to release anything they would have done so. XBMC was in talks with Allwinner and said they would support XBMC devs with code but they bailed on XBMC. Do not expect any support from Allwinner for any type of code/drivers/libraries. I thought Tom Cubie was an Allwinner employee? If he can’t get any support from allwinner do you think anyone else can…. What is the operating temperature range of this board? On Aliexpress it is now $59 without shipping. I ordered one board just after this blog post was published including free shipping by China Mail. Shop sent me email and said that it doesn’t have free shipping. After few emails I got free shipping to Finland by DHL. Now shipping seems to cost $19.47 to Finland by DHL. Embeddedcomputer shipping to Finland is €27.53 which is quite an expensive, almost 50% for the price of the board. Why do you want this board specifically? Indeed for this price I can buy something more powerfull, but it’s hard to find some boards with sata. Allwiner A20 boards have gbit Ethernet, but not this one? Indeed all to expensive, I can buy a matrix board with a imx6q for 80€. I think I go for that one, altough i don’t know if these have I2S available to connect a DAC. I was first planning to buy a bpi R1 (or lamobo R1). But I understand from the armbian forum it’s crap It seems indeed that the banana pro has a good design. I would avoid the R1 (great idea but totally f*cked up implementation). And be careful regarding I2S. Not many A20 boards route it to the outside. I will wait until they tested it.